I love any type of kebab. They’re super easy to make and are always very healthy. This recipe is no exception. It will be added to my collection of favorite Weight Watchers dinner recipes. I found it in my Weight Watchers Ready, Set, Go! Cookbook. Lamb is a meat that I don’t normally cook with. I’m really not sure why because I do like the taste of it. I even had to ask the butcher guy in Wegmans to show me where it was located. But, now that I know where I can find it, I’ll be making this recipe more often. Meanwhile, to make dressing, whisk together lemon juice, oil, 1/4 teaspoon of salt, and 1/8 teaspoon of black pepper in large bowl. Spray broiler rack with nonstick spray. Preheat broiler. 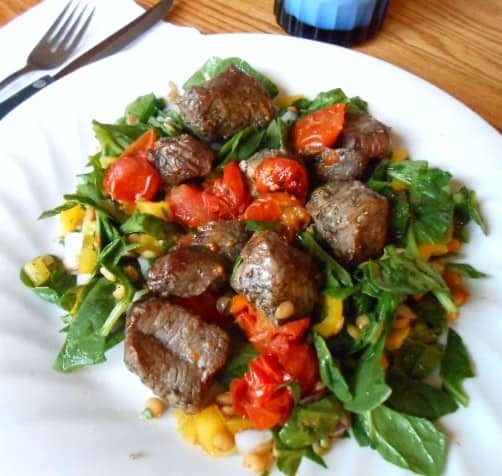 Toss together lamb, oregano, and remaining 1/4 teaspoon salt and 1/8 teaspoon black pepper in large bowl to coat evenly. 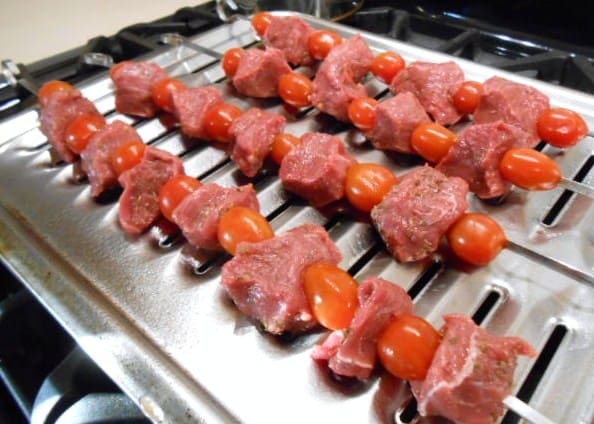 Thread lamb and tomatoes evenly onto 4 (12-inch) metal skewers. Broil 5 inches from heat, turning, until lamb is cooked through and tomatoes are softened, about 8 minutes (mine took a total of about 20 minutes to completely cook due to the fact that the lamb chunks were larger in size). 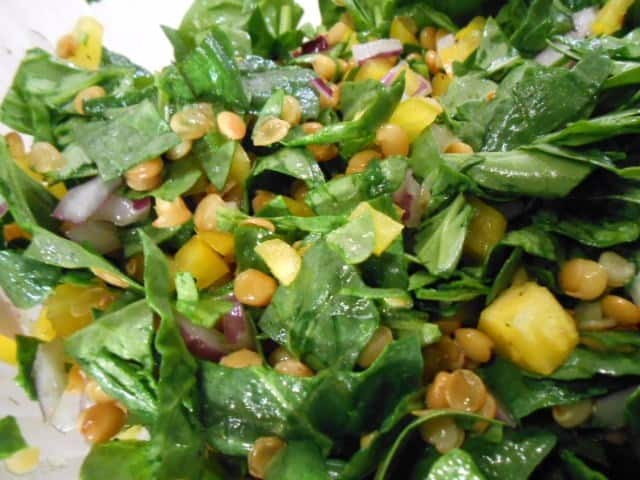 Add lentils, spinach, bell pepper, and onion to dressing; toss until mixed well. Spoon lentil salad onto platter and top with kebabs. When I was preparing it, my husband looked at me like, ‘Aw Lord, what is she making now.’ He especially didn’t think he’d even try the Spinach-Lentil Salad because of the lentils. 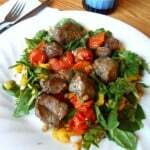 However, after it was all prepared and he ate some of the broiled lamb, he ventured into the salad and really liked it. We told our 7 year old son that the lamb was steak. He wouldn’t try the salad, so we served him the lamb with some corn and he ate it up. 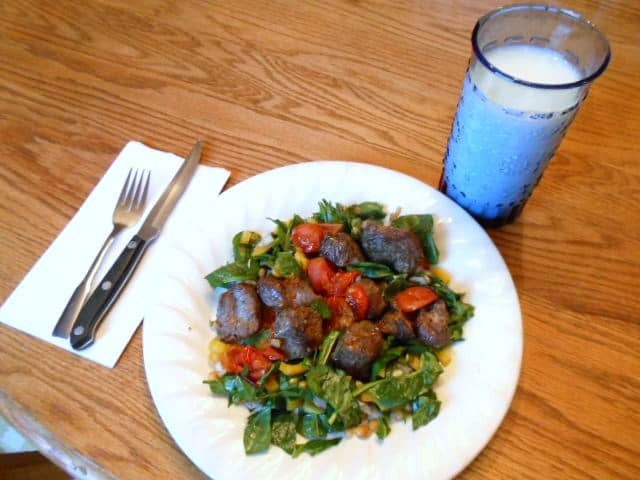 The combination of the broiled lamb with the fresh spinach salad was so tasty! The oregano on the lamb really enhanced the taste. The red onions and the bell pepper, along with the fresh spinach was such a nice combination. Everything tasted so fresh. We ate all of the lamb for dinner. However, I had a bunch of the spinach-lentil salad leftover, so I added some leftover grilled chicken to it the following day and ate it as my lunch. Mmmmm Mmmmm! So good! 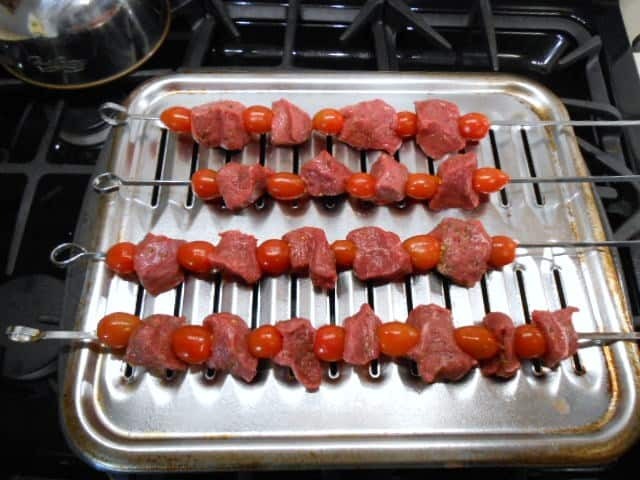 Instead of using the broiler, you can also grill the kebabs on the grill and add chunks of onion or whatever else you want, maybe some mushrooms, to the kebabs. Veggies are 0 points in Weight Watchers, so add more veggies to your heart’s desire. This recipe was so easy to make and really really good. It will definitely be in my arsenal of recipes to make again. And at 8 points per serving, you cannot go wrong with it. Wanna see more posts like this delivered straight to your Inbox? 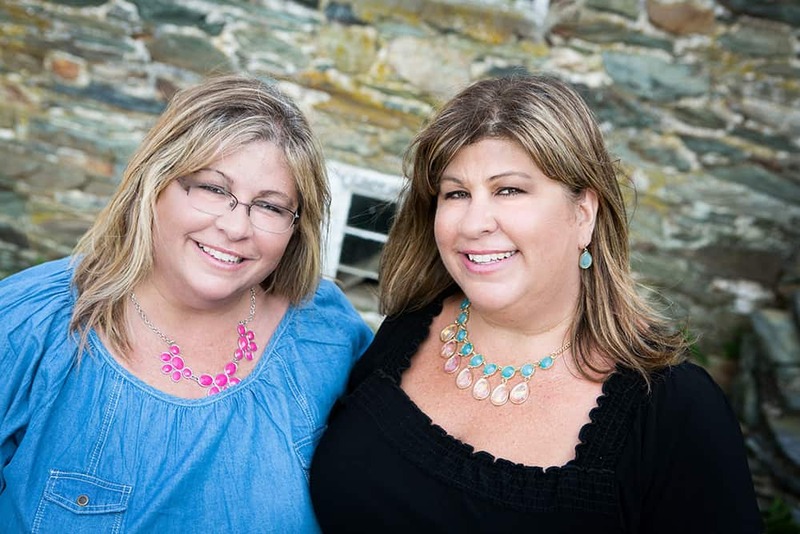 Go to the Subscribe box at the top of our blog and enter your email address! Share this post on Facebook, Twitter, and Pinterest. You know how much I love lamb–it’s the Greek in me after all!! 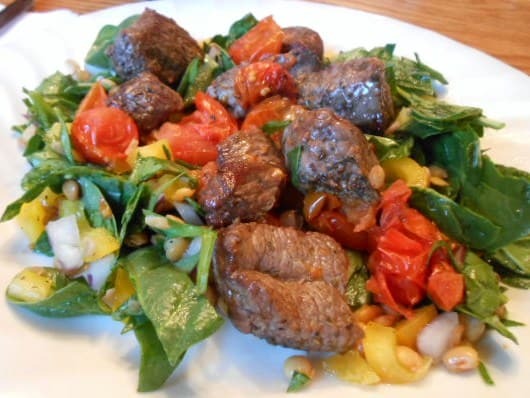 I’ve made lamb kebabs before but have never seen this recipe served with the salad–yum!!!!!!!!!!! I’ll be trying it for sure! !